We’ve got the extended University of Chicago essay prompts for the Class of 2019. The University of Chicago essay questions have, for many years, been among the most unusual — if not the most unusual — of all highly selective colleges. We at Ivy Coach think this is quite admirable and have previously said as much. Essentially, the University of Chicago dares to challenge the status quo, to defy highly selective college admission convention by mandating that students answer their unique essay prompts. And why is it so bold, you ask? What’s it to them to ask a few strange questions that no other college asks? Well, by doing so, the University of Chicago invariably hurts its “US News & World Report” ranking. You see, when a university has such unique essay prompts, fewer students are going to apply because they’re lazy and they don’t want to write a ton of essays that are only suited for the University of Chicago. With fewer applicants, the acceptance rate will invariably be higher and the school’s “US News & World Report” ranking will be damaged. But the University of Chicago office of admissions isn’t dumb. Quite the opposite. They know all of this. The University of Chicago wants students to apply who actually want to attend their university — unlike many highly selective colleges that encourage unqualified students as well as students they know won’t attend if admitted to apply. Thus the University of Chicago — in the world of highly selective college admissions — is rather heroic. They march to the beat of their own drum and we at Ivy Coach salute them for it. Essay Option 1: What’s so odd about odd numbers? Inspired by Mario Rosasco, Class of 2009. Essay Option 2: In French, there is no difference between “conscience” and “consciousness”. In Japanese, there is a word that specifically refers to the splittable wooden chopsticks you get at restaurants. The German word “fremdschämen” encapsulates the feeling you get when you’re embarrassed on behalf of someone else. All of these require explanation in order to properly communicate their meaning, and are, to varying degrees, untranslatable. Choose a word, tell us what it means, and then explain why it cannot (or should not) be translated from its original language. — Inspired by Emily Driscoll, an incoming student in the Class of 2018. Essay Option 3: Little pigs, french hens, a family of bears. Blind mice, musketeers, the Fates, Parts of an atom, laws of thought, a guideline for composition. Omne trium perfectum? Create your own group of three, and describe why and how they fit together. – Inspired by Zilin Cui, an incoming students in the Class of 2018. Essay Option 4: Were pH an expression of personality, what would be your pH and why? (Feel free to respond acidly! Do not be neutral, for that is base! – Inspired by Joshua Harris, Class of 2016. Essay Option 5: A neon installation by the artist Jeppe Hein in UChicago’s Charles M. Harper Center asks this question for us: “Why are you here and not somewhere else?” (There are many potential values of “here”, but we already know you’re “here” to apply to the University of Chicago; pick any “here” besides that one). – Inspired by Erin Hart, Class of 2016. Essay Option 6: In the spirit of adventurous inquiry, pose a question of your own. If your prompt is original and thoughtful, then you should have little trouble writing a great essay. Draw on your best qualities as a writer, thinker, visionary, social critic, sage, citizen of the world, or future citizen of the University of Chicago; take a little risk, and have fun. Let us know what you think of this coming year’s University of Chicago essay questions by posting a Comment below! 1.) Admit rate is an extremely small component to the U.S. News & World college rankings. 2.) 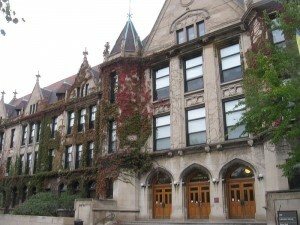 UChicago is one of the most guilty schools of marketing to students who have no chance to be admitted.